You may notice that when you are attempting to edit a page or post, the Visual tab has disappeared and you are left with the Text only option. 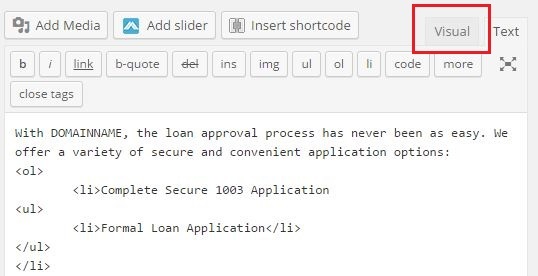 This is a rare bug with the editing tool used to manage content. Until this bug is corrected, you will need to take a few quick steps to make the visual tab reappear. You will need to hover over your username in the upper right corner of your website dashboard. 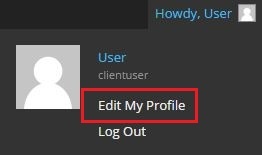 This will make the "Edit My Profile" link appear which you will click on. Next you will need to check the first box at the top of the page that says "Disable the visual editor when writing." This should be unchecked when you first arrive on the page. Scroll to the bottom of the page and click Update Profile. You will be taken back to the top of the page after you saved the previous step. You will now need to uncheck the same box that says "Disable the visual editor when writing." Scroll to the bottom of the page and click Update Profile once more. You should now be able to go back into your post or page and see the visual tab.